Fonons Canyon 3D Deep-Engraving System cost is less expensive, deep-engraves at almost 2X the processing speed, requires no consumables and is 100% maintenance-free. There is no workplace or environmental hazards with a superior quality of workmanship when compared to vertical milling machines. 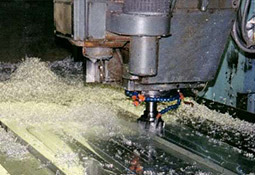 Milling is the machining process of using rotary cutters to remove material, a tradition dating back to the 1800’s. Milling is a cutting process that uses a milling cutter to remove material from the surface of a workpiece by performing many separate cuts. The cutting action is classified as shear deformation. 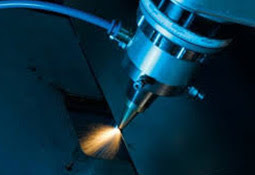 Fiber laser is a next-generation technology using a high-power energy source to perform the same function. Fiber lasers are compact and rugged, do not go out of alignment, and easily dissipate thermal energy. Fonon’s Canyon 3D deep-engraving Fiber laser systems range from entry level at $35K to high-volume production systems at $150K. Starting prices for 5-Axis vertical milling centers range from $155K to $190K. An aluminum application was deep-engraved down to a minimum depth of 0.01” requiring both a logo and rows of text. 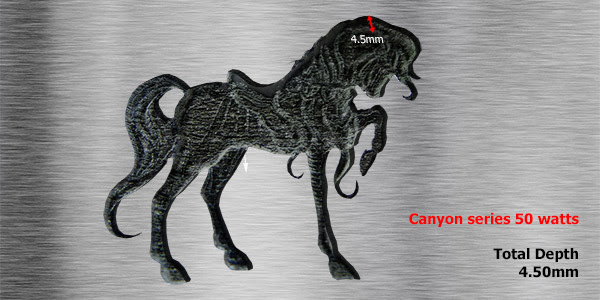 Fonon’s Canyon 3D Deep-Engraving System completed the operation in 2 minutes, 23 seconds. The CNC vertical milling machine completed the same operation in 4 minutes, 37 seconds. The Canyon 3D Deep-Engraving System requires no consumables. CNC milling machines require extensive and costly consumables including spindles, milling cutters, mill bits, drawbars, collets, belts, anti-seizer compounds, and other lubricants including hydraulic oil, lubricant, grease, coolants, and cutting fluids. The Canyon 3D Deep-Engraving System poises no environmental health risks to both the workplace and environment. Fumes are captured by a fume extractor and metal debris is capture via a vacuum table. Mechanical milling machines are subject to a number of environmental concerns. Spent cutting fluids and metal chips are the two major sources considered hazardous waste. Workers in machining operations are continually exposed to cutting fluids with dermatitis and respiratory problems cited the most frequent health concerns. The Canyon 3D Deep-Engraving System has a MTBF rating of more than 50,000 hours designed to operate under continuous hi-vibration, shock, and dust conditions. Fonon’s Canyon 3D Deep-Engraving System cost is less expensive, engraves at almost 2X the processing speed, requires no consumables and is 100% maintenance-free. There is no workplace or environmental hazards with a superior quality of workmanship when compared to vertical milling machines. Fiber laser deep-engraving is an art form in and of itself. Fonon’s Canyon 3D Deep-Engraving System incorporates proprietary laser processing IP setting the industry standard for quality of workmanship and processing speed. There is no other laser-based system that produces 3D deep-engraving images which compares to the quality of Fonon’s 3D Canyon Deep-Engraving System. Sample: Deep etching and fine detail using the Canyon system.